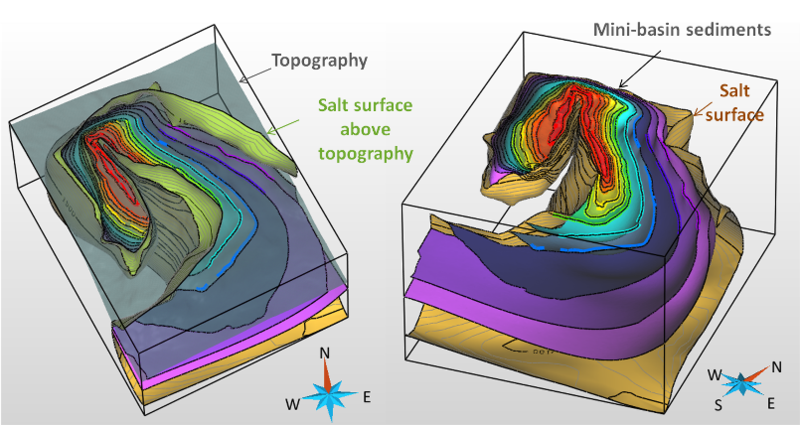 Capitalizing on more than 25 years of research in geomodeling, we have developed multidisciplinary skills in geoscience, software and engineering. 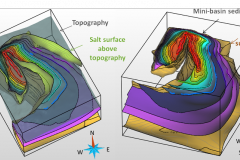 This expertise is shared daily with fellow researchers of GeoRessources and students of the Nancy School of Geology. The Annual Meeting provides opportunities to also share this expertise with Consortium members. Visits, summer internships of graduate students and collaborative projects also make it possible to collaborate and share expertise with sponsors. We provide 9 synthetic watertight structural models (in Gocad's model3d ascii format). Their purpose is to test and benchmark geomodeling algorithms. You may reuse and modify these models for research and educational purposes without limitation, provided that you cite our 2015 Computers&Geosciences paper. On this webpage you can visualize and manipulate 3D models that have been built and exported to an HTML page using two Gocad plugins (FaultMod2 and WebExporter) developped and maintained by the members of the RING team. Those examples were generated by Gabriel Godefroy during his PhD.